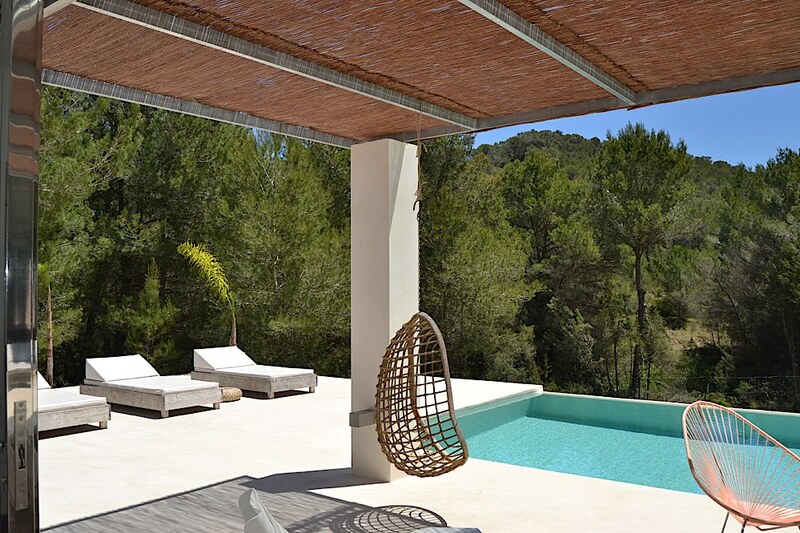 Can Tumasi is a luxury Ibiza villa rental with stunning infinity swimming pool. 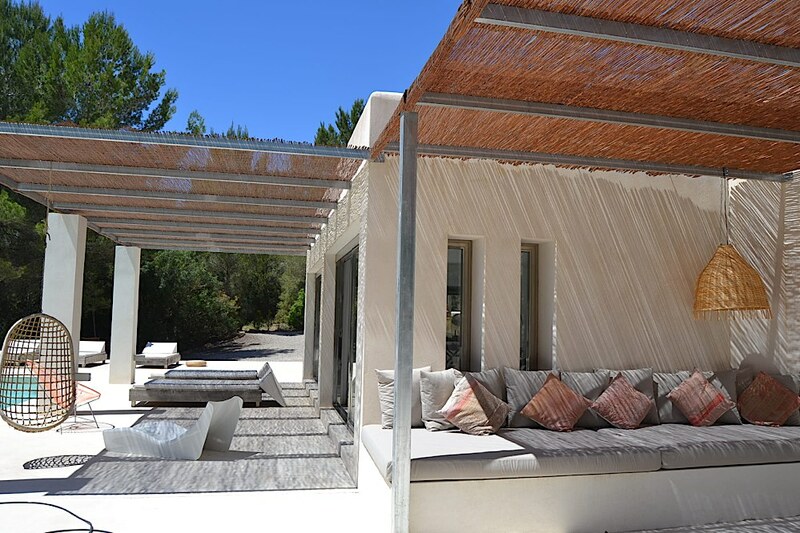 Set in a peaceful, exclusive location, on the south west of Ibiza with many of the most beautiful beaches just a short drive away and also just five minutes from the pretty village of San Jose. 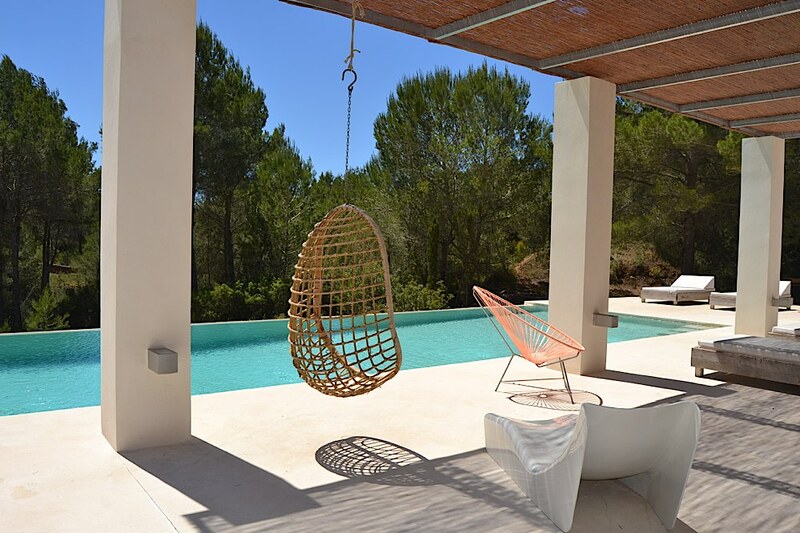 This stylish Ibiza villa is contemporary in design and furnished to a very high standard. 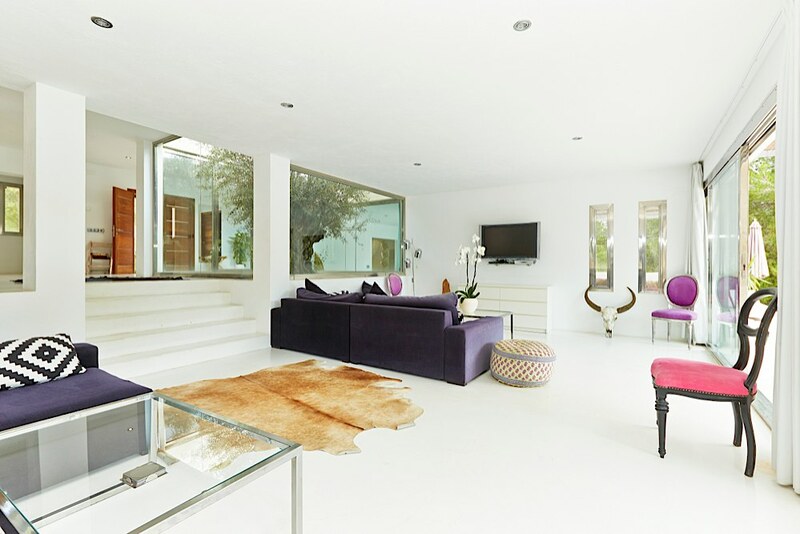 Sleek and modern with polished cement floors throughout. 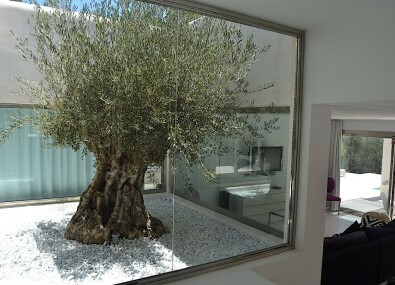 Floor to ceiling feature stainless steel framed glass sliding doors create light and airy rooms. At the center of the living area is a feature garden atrium with mature olive tree. Can Tumasi features in photo shoots for interior and fashion magazines and also in many advertising campaigns, including Grazia, Marie Claire, Stella McCartney and Belstaff. 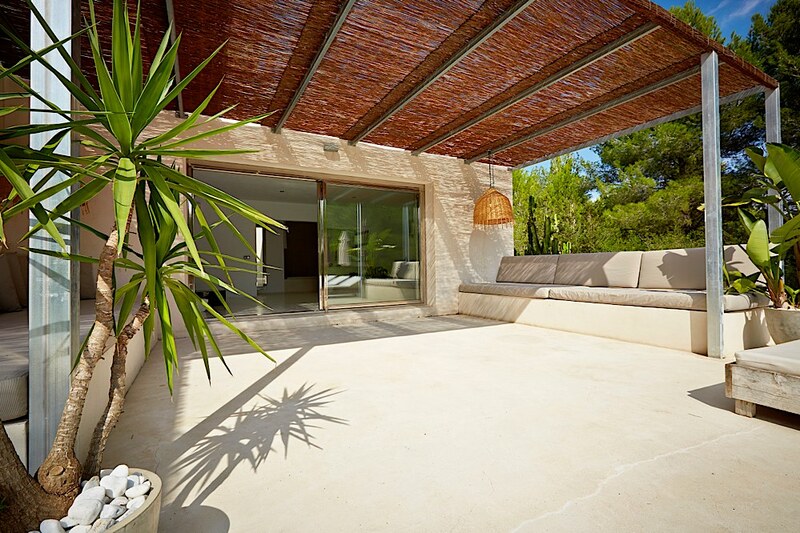 Surrounded by a fence with an electric gate and alarm system, the villa is very secure. Air conditioned throughout and boasting a fire and underfloor heating for early and late bookings. Sun terraces with comfortable day beds and sun loungers surround the stunning infinity swimming pool. 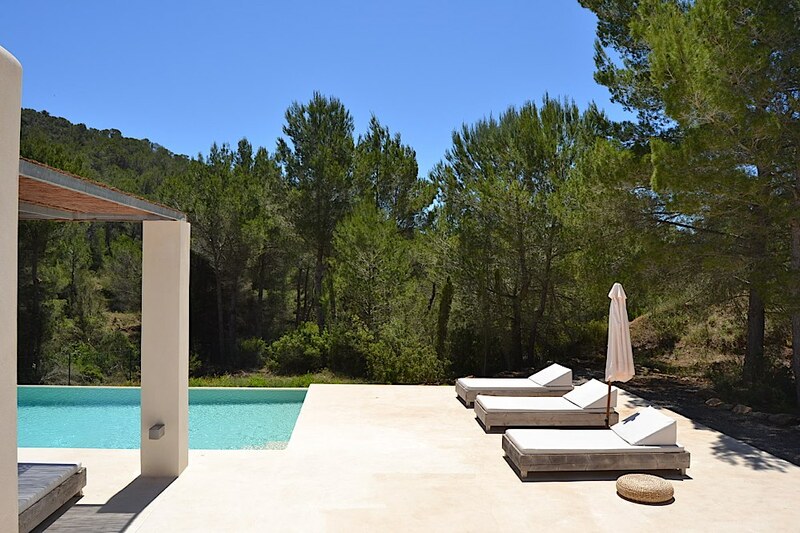 Set within beautiful Ibiza countryside, Can Tumasi feels private and tranquil, yet is conveniently located for Ibiza Town, Es Cubells and San Jose. 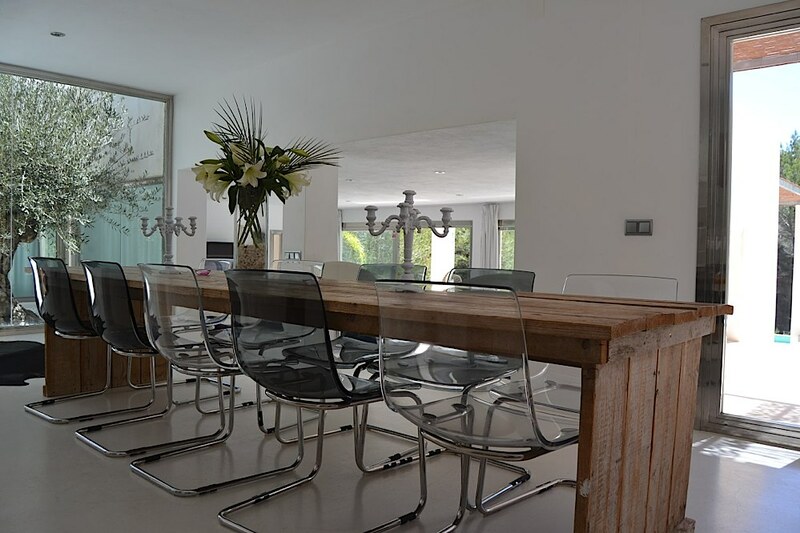 Spacious open plan living with lounge, dining and kitchen areas. Glass doors the full width of the villa open onto the terrace. The living area features a 40 inch LCD flat screen TV with Sky satellite, iPod docking station, two large comfortable sofas and a log burning fire. 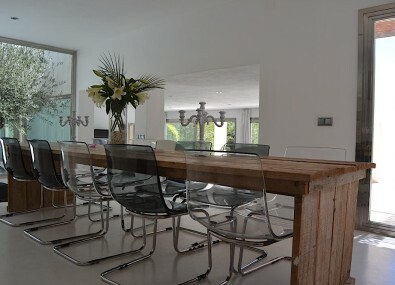 Dining area has a large wooden table and chairs to seat ten people. Modern well equipped kitchen featuring a Smeg stainless steel range cooker, Liebherr double stainless steel fridge/freezer with wine cooler, dishwasher, microwave, Nespresso coffee machine and juicer. Doors lead out to an outside kitchen terrace area sink and BBQ. There are five bedrooms and four bathrooms in total. 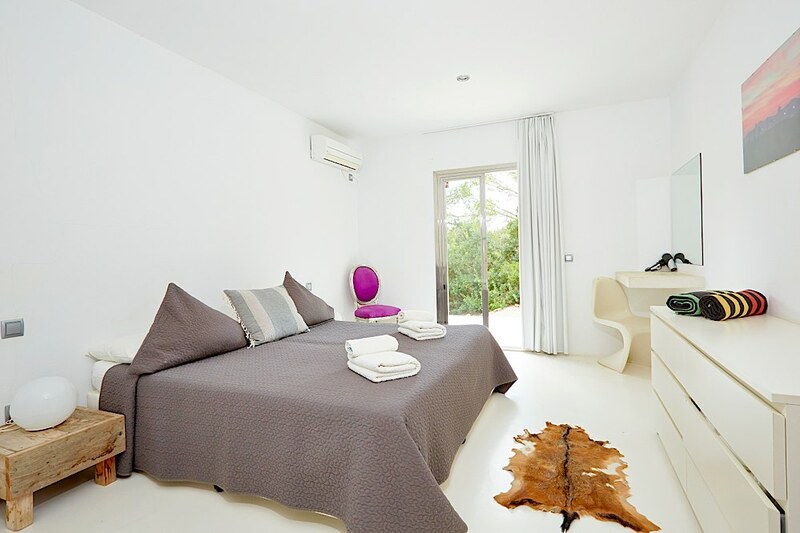 Beautifully furnished, all the bedrooms feature queen size beds. Four can be made as twin bedrooms, excluding the master. 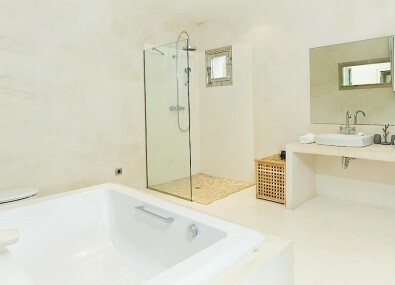 Master double bedroom suite with en-suite bathroom (bath and shower) with large glass sliding doors onto the sun terrace. 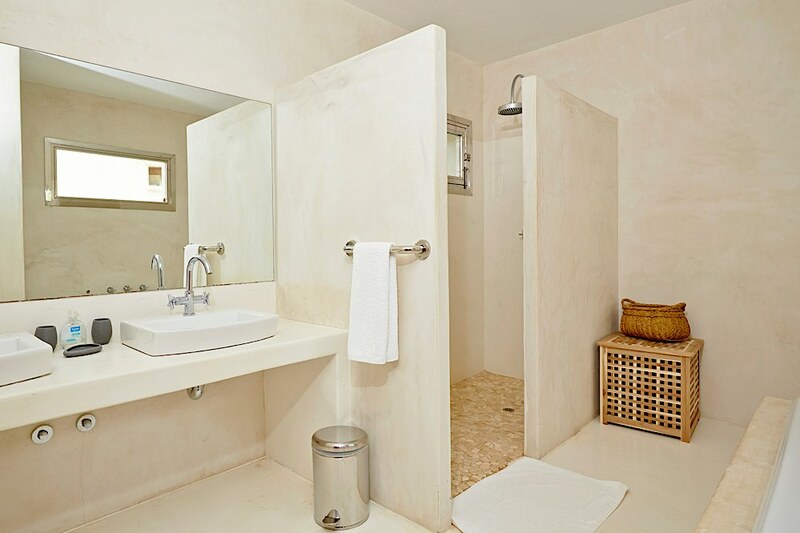 Bedroom 2 and 3 have their own en-suite shower rooms. Bedroom 4 and 5 share one shower room. Located in the living area is a guest WC. 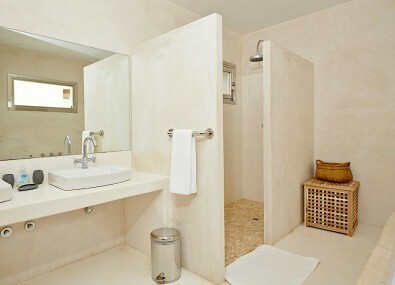 There is also additional shower room is located outside. Relax on the large built-in day beds in the chill out area or one of the sun loungers by the private infinity swimming pool. Located in the garden there is also a tree house/chill out area, as well as an outdoor ping pong/table tennis table. 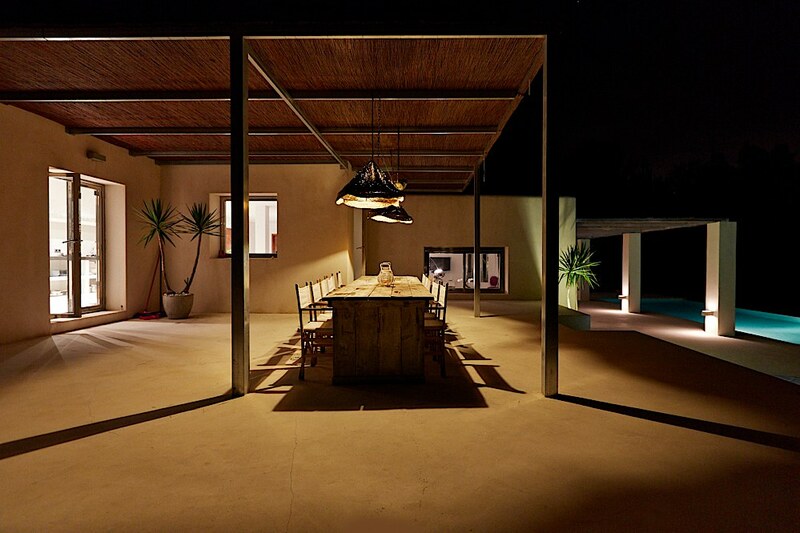 Perfect for alfresco dining is the large wooden table to seat ten on the covered terrace. 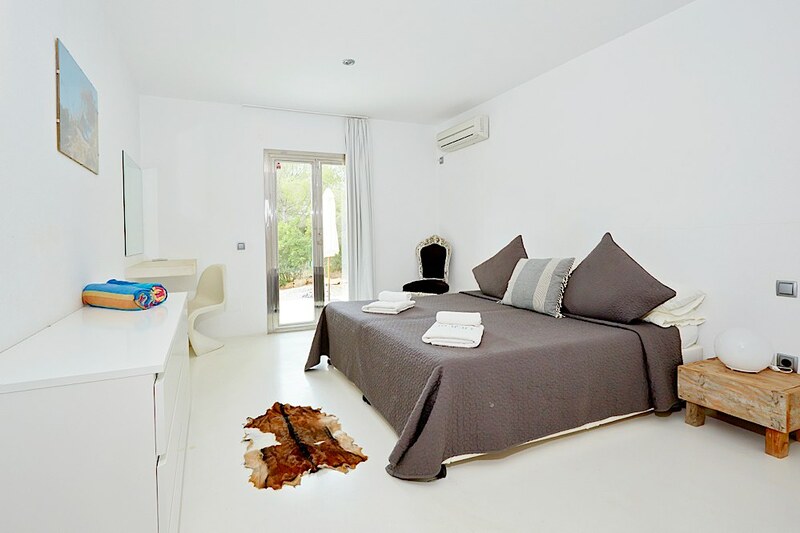 Conveniently located – 8km from Ibiza Town and five minutes to the village of San Jose. Also five minutes to the beach of Cala Jondal with the exclusive Blue Marlin and Tropicana beach clubs, as well as Es Xarcu and Es Torrent beaches, both with excellent seafood restaurants. In addition, 15 minutes to the stunning beach of Salinas with Jockey Club and Sa Trinxa beach clubs. The airport is also within ten minutes of the villa. 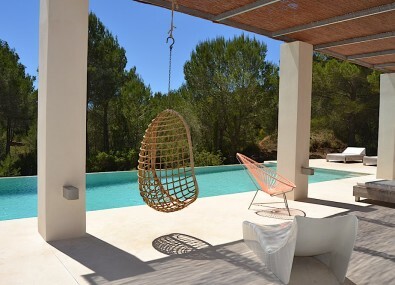 Can Tumasi is a perfect luxury Ibiza villa rental. 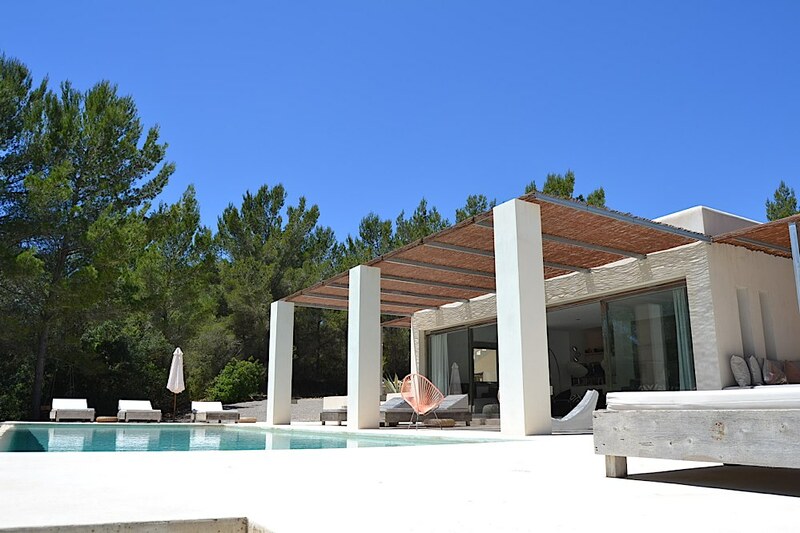 A small independent company based in Ibiza, Ibiza Villas Direct offer exclusive Ibiza villa rentals with a personal touch. We pride ourselves in being at your service from arrival to departure, ensuring your stay is as relaxed and hassle free as possible. We can arrange car hire, boat charter, chauffeur and also private airport transfers, in-villa massage and beauty treatments; in addition to weddings and much more. 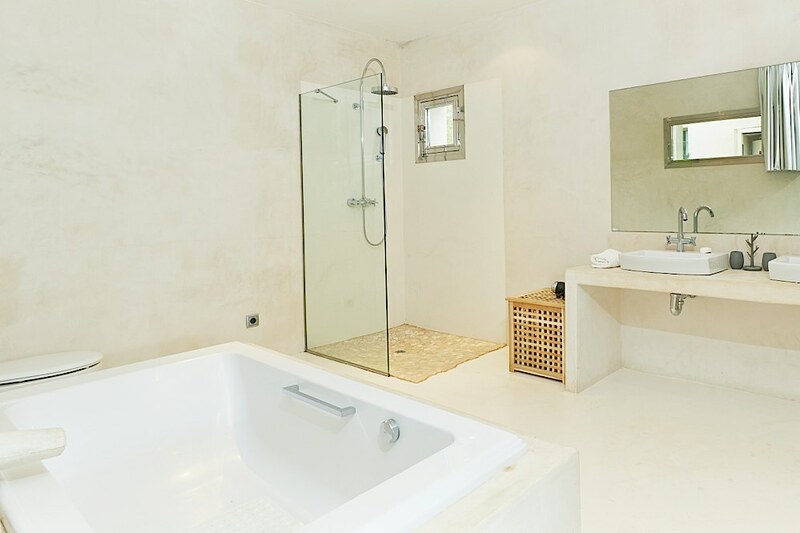 Carefully hand picked, all of our villas are equipped with swimming pools. 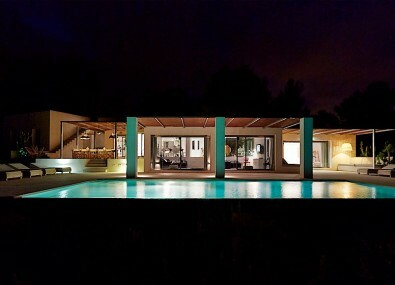 We also have a private selection of high end luxury villas, for something extra special please email us for options. 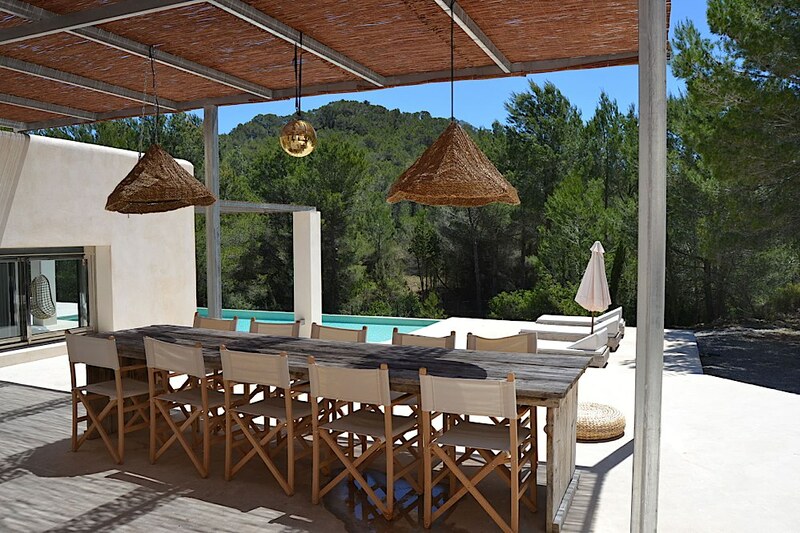 Ibiza Villas Direct and all the villas we represent are registered with the Tourism Board in Ibiza. You can be ensured that quality villas and quality service is what we offer. Total heaven! So chic with wow factor everywhere but relaxed and very chilled. Pool superb, grounds really large with so much privacy and peace. 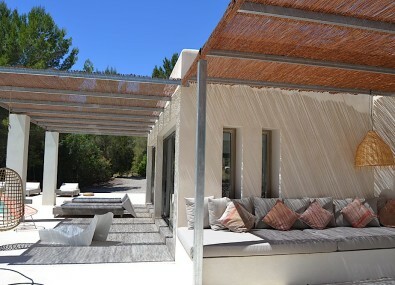 Fabulous large wooden loungers, outdoor kitchen and dining area plus chill out seating area too! Main suite so gigantic! 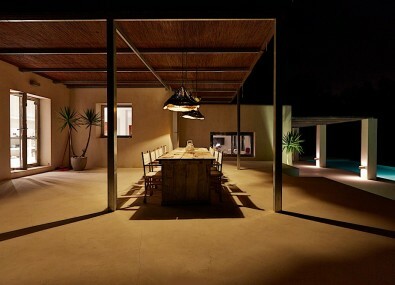 Very cool open plan kitchen sitting area with concrete floors and olive tree atrium. All so much bigger than looks in photos! Very very lovely owners - would love to return every year!